I am finishing up my July projects. Since things may be changing for our family, I decided not to attempt any of the painting projects I've had planned. So, I've been focusing on my sewing. I've really enjoyed creating new things, getting those long dormant creative juices flowing. Today I finished a pair of shorts for my oldest daughter. 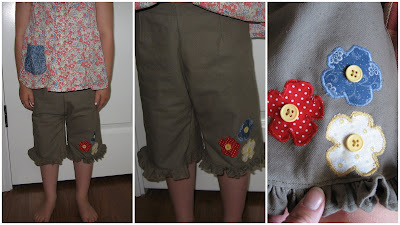 I used a pair of Gymboree capris as a guide, and fabric that I'd bought for another project that got "scrapped". I like juxtaposing a rough canvas fabric with a girly pattern. The front of the shorts are polished with a facing and darts. The back has elastic to keep a good fit. I've decided I love using ruffles to finish edges...it looks fun, and I don't have to measure hems! The applique is similar to the one I used on my baby's birthday outfit, I just satin stitched the edges. One outfit down...another blouse to go. Very cute Chris! I love the capris. You are so talented!